Thankyou for taking the time to view the items that are available for sale. 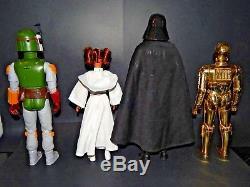 The item that you are currently view is a vintage star Wars 12 inch scale lot of Action Figures. 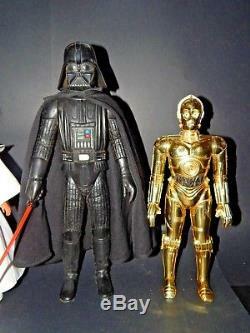 Vintage star wars 12 inch scale Action Figures in good used condition. Figures display some play ware. Boba fett is missing some of his accessories and has loose legs. 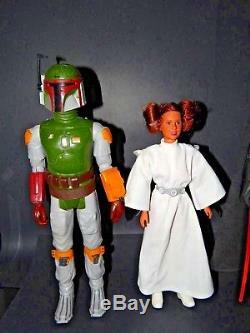 Darths saber has a stress mark near the tip, C3PO is missing his thumbs, Princess leia has replacement shoes. Please feel free to ask any questions that you may have. Happy collecting and investing, as these guys are forever increasing in value as the time goes on. Please check out the other items that I have on offer. 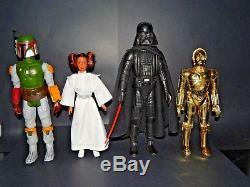 The item "Vintage Star Wars 12 Inch Lot Darth Vader Boba Fett Princess Leia C-3PO" is in sale since Saturday, June 16, 2018.